Mia Headband is from Gypsy Renaissance's Headbands Collection. 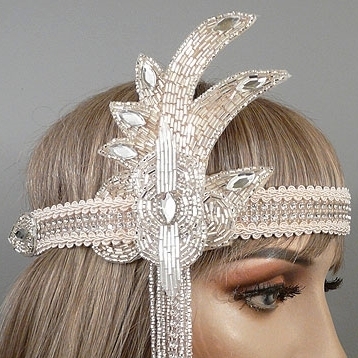 Mia is a flapper headband with glass beaded appliqués, rhinestone dangles, and rhinestone trim. Mia is an elastic flapper headband fashioned with rhinestone banding and decorative trim. The headband is embellished with elaborate glass beaded appliqués, glass beaded fringe, and a rhinestone-banded dangle. Finished with crystal rhinestones. Available in Ivory/Silver and Black/Silver.